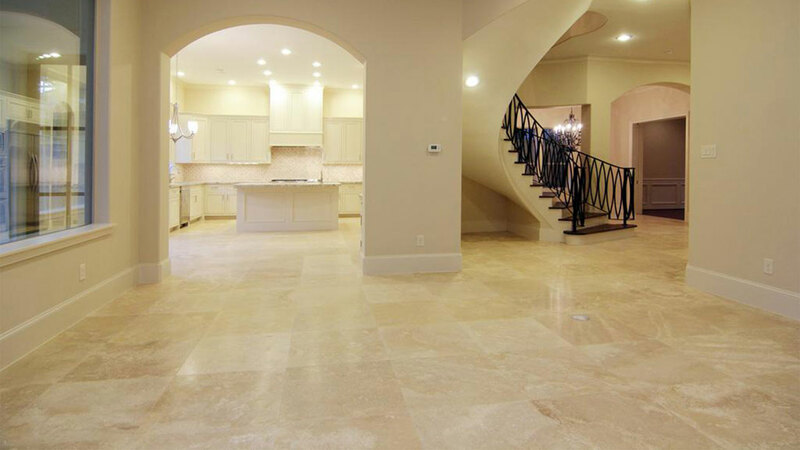 Limestone floors are more than just aesthetically pleasing; they are stunningly beautiful. Not only do they add value to your home; they also create a hard-wearing and durable surface that will last for decades. But just like any other flooring surface, they require care to always look their best. The main thing to remember is that only a PH neutral cleaning product should be used to wash or mop the floor, or to spot wash a spill. Most household cleansers are acidic, but the acid will have a negative effect on the limestone, eating it away over time. When the floor is first laid, it will have been sealed, so this will keep the floor in good shape for some time. But when water no longer beads on the top it is soaking into the floor, which means it is time to reseal. Being porous, limestone will absorb moisture – and stains – unless it is kept sealed. Even when resealing, care must be taken not to use too much of the product in one spot in case it stains. It should be spread evenly, left for about 30 minutes to soak in, then the excess wiped off. The first sealing should occur before the grout is put in as even that can stain limestone. Two coats of sealant may be necessary. However, if the limestone has been crushed and mixed with cement to make the tiles, it will not be as porous. The supplier will very likely give you instructions on the care of the floor and these should be followed carefully to ensure your beautiful floor is never spoiled. Leaving residual moisture in the cracks. What Is Capital Gains Tax And Does It Apply To Me?